Do you ever feel like you need a classic go-to recipe for fall? Something that tastes like fall, smells like fall (like stove-top potpourri!) and makes you wish summer would end early so you wouldn’t look weird making it? Oh yeah, and something that’s fairly easy and straightforward too would be nice. 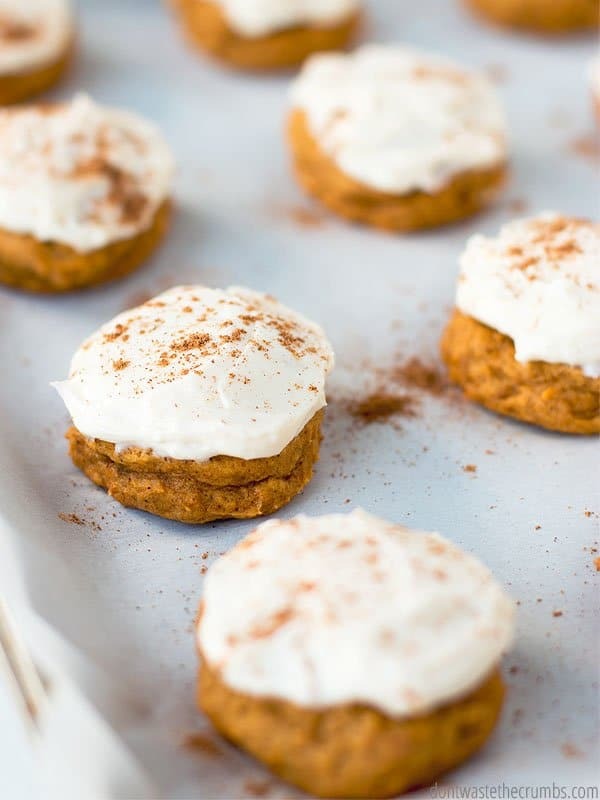 How about pumpkin cookies with naturally sweetened cream cheese frosting? Oh yes, I think that will do the trick. 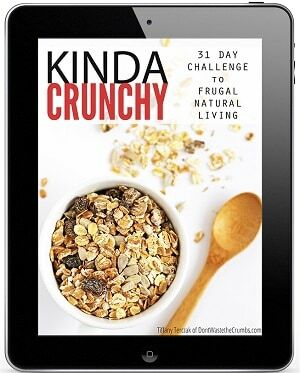 Confession – I LOVE cookies… like oatmeal chocolate chip and molasses breakfast cookies. And I LOVE pumpkin… especially in pumpkin donuts, pumpkin larabar bites and overnight pumpkin French toast. But I’ve never actually made PUMPKIN COOKIES before. It should have been a no-brainer, but my husband isn’t a huge fan of pumpkin so I kind of put pumpkin on the back burner every year until it’s time to make pie. Shame on me though – that’s not fair to my fellow pumpkin lovers out there (or me!). But first, we make cookies. One thing you should know about these cookies is that while they do have sugar, they have SIGNIFICANTLY less sugar than most other cookies. Case in point: My recipe was inspired by this recipe, which calls for 1 cup of white sugar and ½ cup of brown sugar. And then another 2 cups of sugar in the icing. YIKES! It’s no secret around here – I love dessert. My friends even know that it’s “my thing” to eat dessert for breakfast. 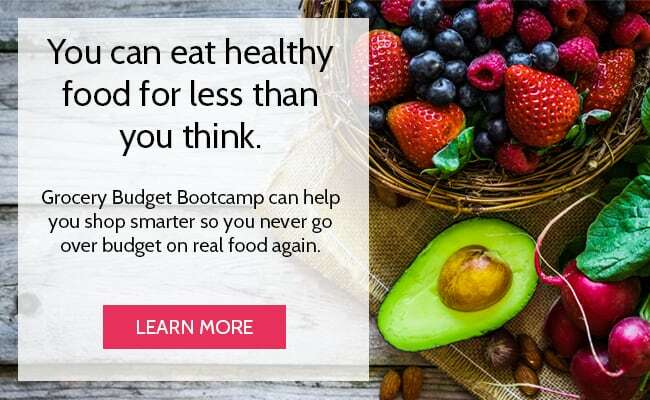 HOWEVER, my family and I quit processed sugar and since being on the real food train for a few years, we’re now super conscious about how much sugar we feed ourselves and the kids. It’s not that all sugar is bad, but we do believe in using natural sugar whenever possible, and even then, in moderation. Friends, 3 ½ cups of processed sugar IN ONE RECIPE is not moderation. 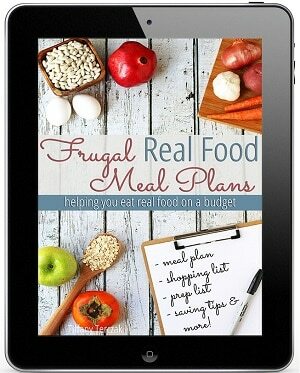 Thinking about food priorities is something I teach in Grocery Budget Bootcamp. 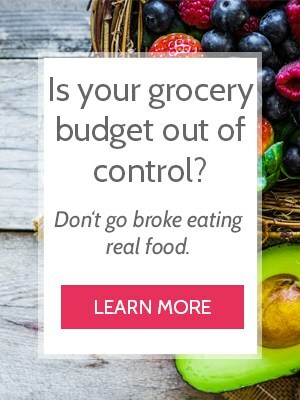 It will be different for every family and it will affect what your grocery budget looks like. 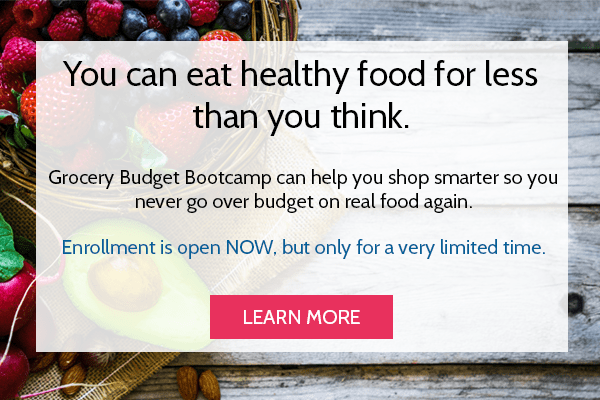 There’s not a right or wrong way, but you do need to think about it to keep your budget on track. Learn more about the course HERE. So the first thing I did was reduce the sugar by almost one-third AND use Turbinado sugar instead of granulated white sugar. Note #1 – Turbinado sugar is not inherently healthier than white sugar, but it’s one-step less processed. 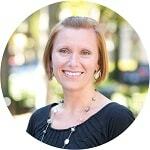 For my family, it’s a baby step in the right direction. Note #2 – Turbinado sugar is less sweet than white granulated sugar, which means if you substitute white sugar, these might taste too sweet. If this is the case, reduce the amount of sugar by 2 tablespoons until you find the sweetness you prefer. I also did something huge and took the processed sugar out of the icing entirely. Don’t worry – I promise you won’t miss it. The fact that my pumpkin-hating husband ate three cookies fresh from the oven and couldn’t stop eating them the rest of the night, is proof. With a whole lot less sugar, you’ll feel a whole lot better saying “yes” if the kids follow your example and ask to have cookies for breakfast. 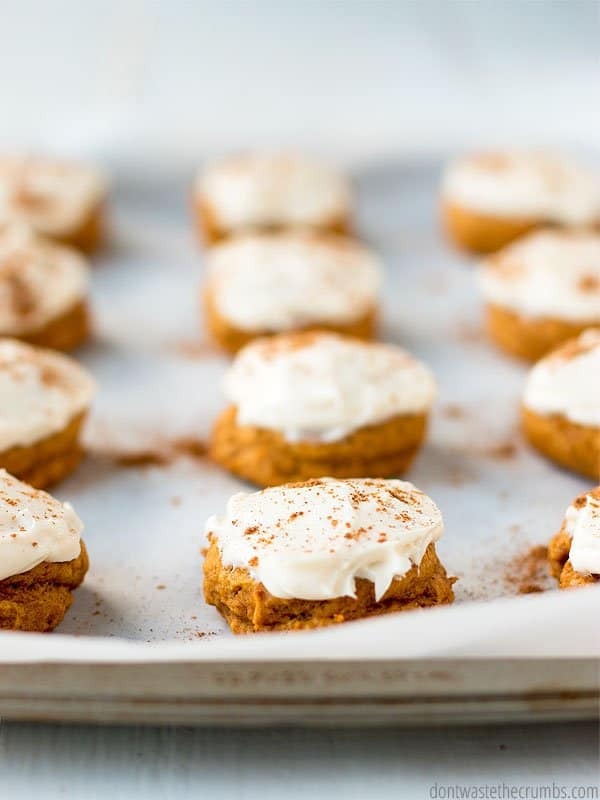 Something else you should know about these pumpkin cookies, is that they taste a little bit like pumpkin pie… and pumpkin cake… together. They taste like pumpkin pie because while I was reducing the sugar, I also swapped some granulated sugar for maple syrup. Because pumpkin + maple syrup = awesome. 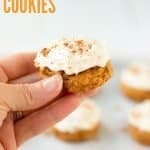 There’s also a full TABLESPOON of pumpkin pie spice in these cookies. Heck, you could probably add more if you wanted to… maybe I’ll do that next batch and report back. 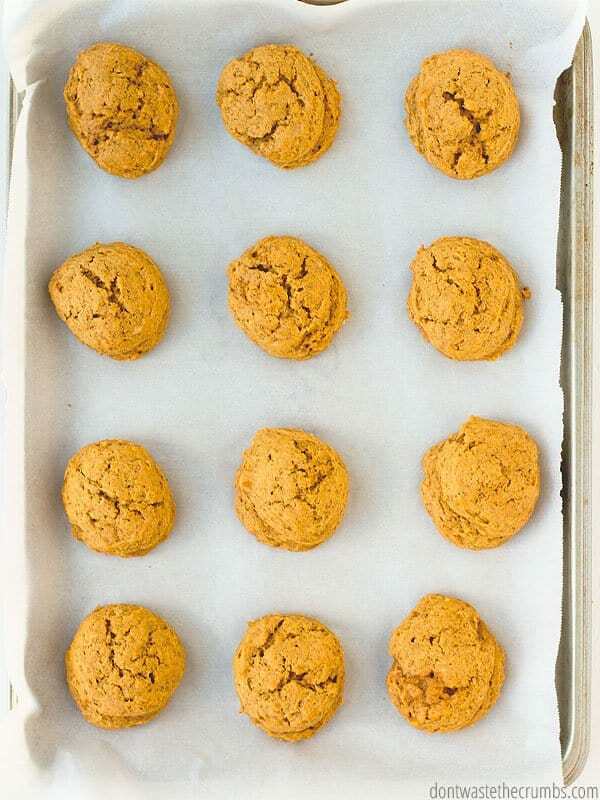 As for these pumpkin cookies tasting like pumpkin cake, that’s because of our flour to sugar ratio and the addition of cornstarch (hats off to Sally’s Baking Addiction for that awesome tip!). It means that these cookies won’t spread on the pan (yay! ), they’ll puff up slightly as they bake (yay!) and they’ll come out of the oven tasting like little morsels of soft pumpkin cake (yay!). 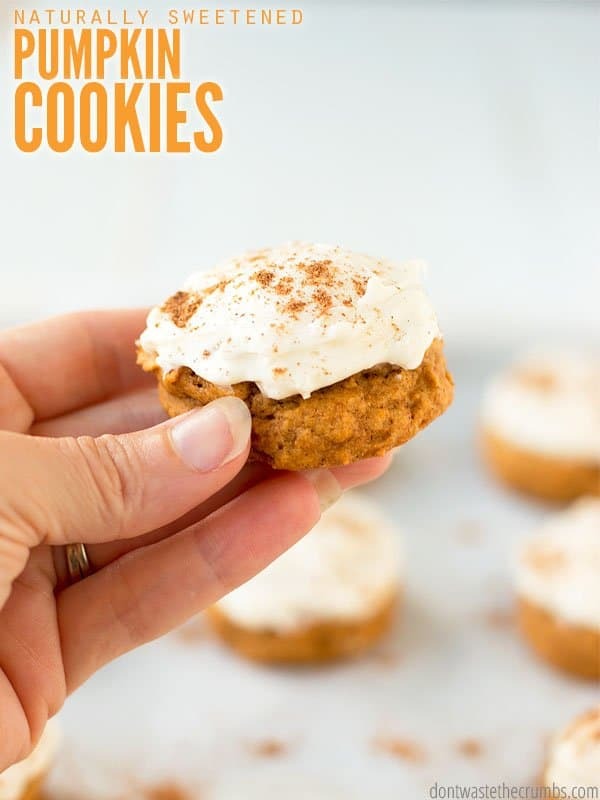 You’ll want to make sure these pumpkin cookies cool to room temperature before frosting, otherwise the frosting will melt right off. But once they’re frosted, call out the cavalry because you’re going to have a heck of a time fighting off the hands reaching for more. These are THE BEST the day they’re baked, but hold up well for a few days if you keep them in a sealed container. Unless you have oodles of fridge space, I recommend making the frosting and storing it in a separate container. Then frost the pumpkin cookies right before eating or serving. These cookies should also freeze well unfrosted! Thaw to room temperature before frosting and you have an instead dessert ready for those holiday gatherings. In a large bowl, or in the bowl of a stand mixer, mix the butter and granulated sugar until the color is very light, about 5-7 full minutes. Add 2 Tbsp maple syrup, molasses, pumpkin puree, egg and vanilla and mix well until combined. Add flour, baking powder, baking soda, salt, corn starch and pumpkin pie spice and mix until JUST combined. Using a cookie scoop, scoop dough onto the prepared baking sheet. 1 scoop of dough will yield smaller, more bite-site cookies. 2 scoops of dough will yield a slightly bigger, more "normal" size cookie. 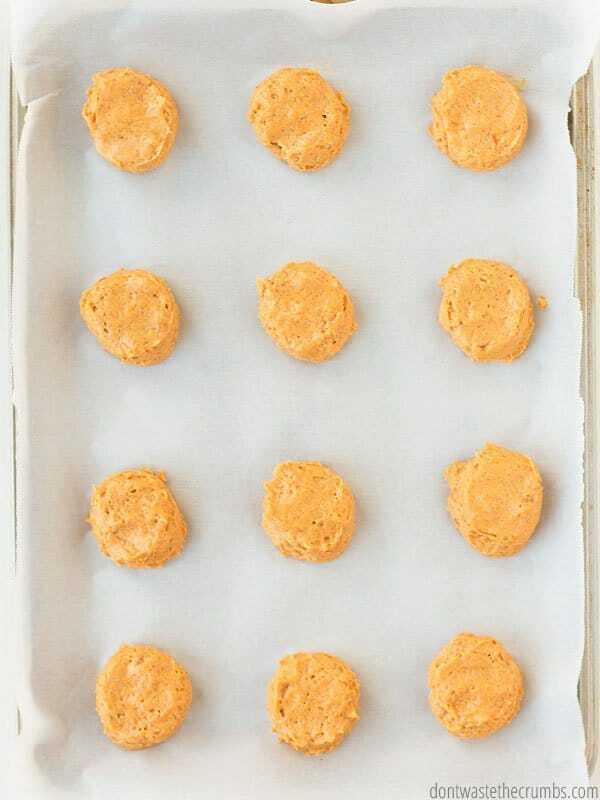 Bake for 15 minutes, or until the cookies are golden brown underneath. Allow the cookies to cool completely before frosting. Meanwhile, prepare the frosting. 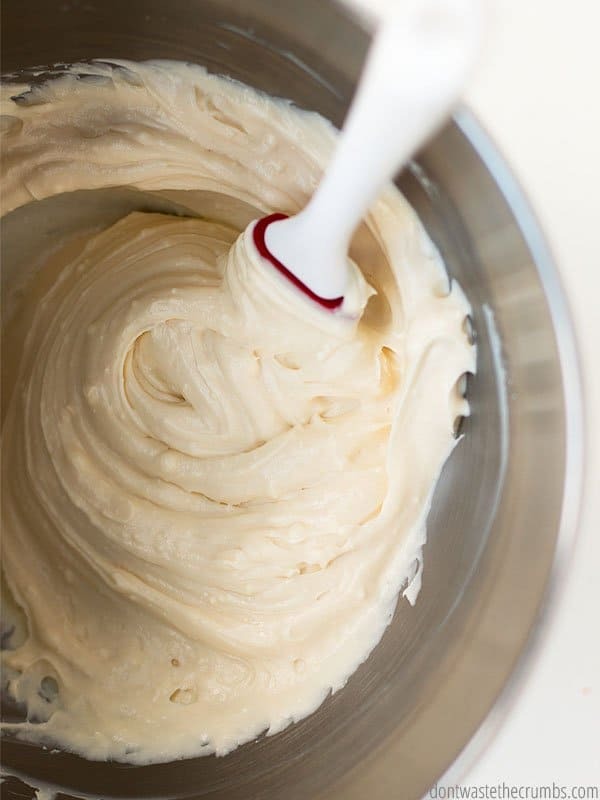 In a stand mixer, blender OR by hand, combine the cream cheese, butter, vanilla and maple syrup. Add the salt and taste, adjusting sweetener as desired. 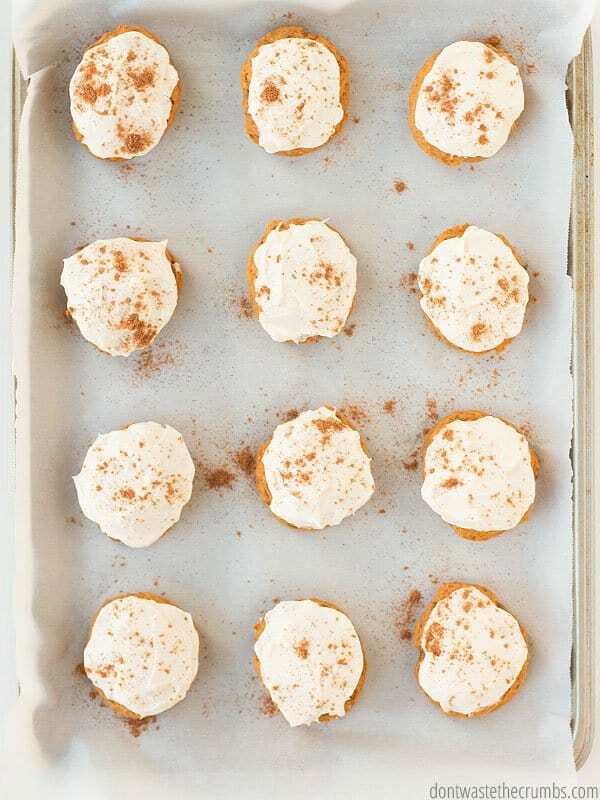 Smear frosting on each cookie and sprinkle with additional cinnamon for decoration, if desired. What is your favorite fall pumpkin recipe? Leave your ideas in the comments below! so excited to try these! Your recipes are so good and I’m thankful for your hard work in experimenting. I typically use coconut sugar in recipes and I’ll let you know how they turn out using that instead of turbinado. It usually makes the finished product darker but it also gives it a little bit of carmelly/brown sugar flavor too! I’m wondering how that extra quarter cup of pumpkin would taste in the frosting, gonna try it next time! Why not try NO sugar in the cookie frosting, since they are already sweet with quite a bit of sugar. PS-I got my family off refined sugar of any kind by not having it in the house at all and sercofruiy only for dessert. (Alert:). Even lots of fruit is bad as it contains lots of sugar!